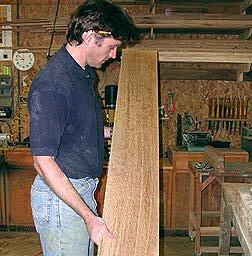 Plainsawn is the most common wood cut. 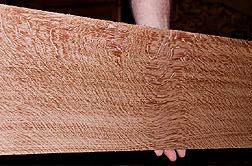 When viewed from the end, the growth rings are parallel to the edge of the board. This kind of cut provides the greatest yield from a log, but the boards contain more variation because patterns from the growth rings are more conspicuous. 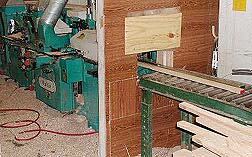 Quartersawn boards show the growth rings roughly perpendicular to the face of the board. Boards cut this way are more expensive to produce because they require more time and labor to saw, and produce narrower boards. However, quartersawn boards warp less than plain sawn, and in some hardwoods, especially oak, a more distinctive pattern of medulary “rays” are produced. We use only quartersawn white oak because of its durable nature and for the beautiful grain patterns that are exposed when the medulary rays are cut during the sawing process. 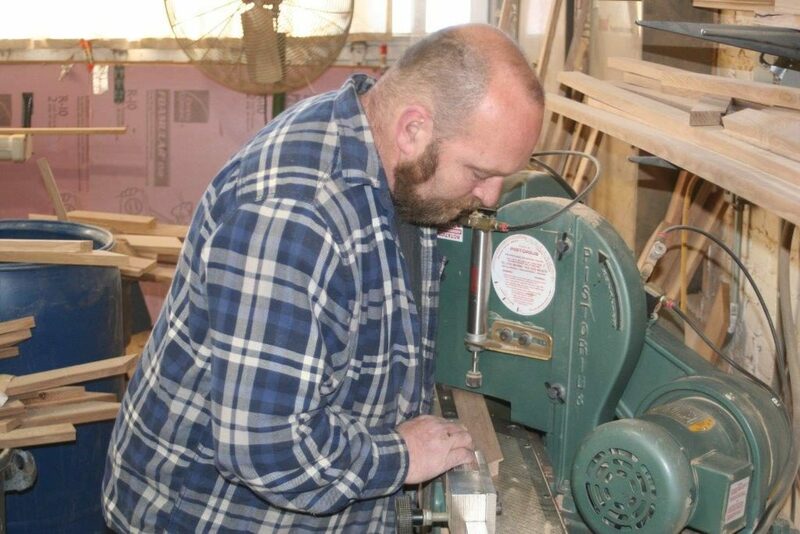 Even though a bundle of quartersawn wood might be purchased at a premium rate, each board must be hand selected to ensure that your frame will possess a nice ray flake pattern. We usually incur a 30% loss from wood that has little or no figure before we even begin to mill it. The wood is then ripped to the appropriate width. During this process, we lose another 30% of the wood from the saw kerf and from yielding widths that are too small to make into frames. At this time, each board is then inspected for the second time for defects and figure. Now the wood is ready to go through a molder to produce the desired profile. For our mortise and tenon frames, the wood is simply S4S, or surfaced on four sides. Our unique beveled molding for our tile frames is achieved by the use of a custom made blade on the molder. The end of each board must first be marked with a black marker to outline the medulary rays. The board is then placed into the molder in the direction that will allow the bevel to cut more parallel to the rays, thus exposing a greater ray flake. 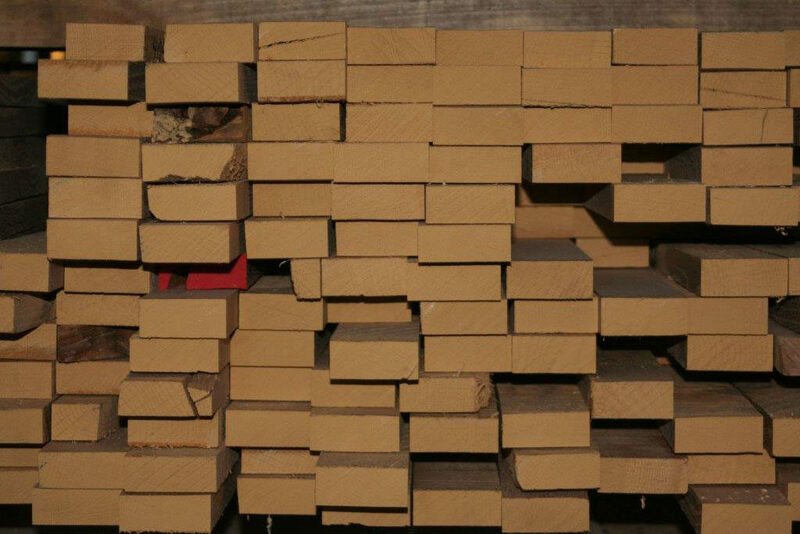 This expensive and time consuming process of molding our lumber ensures 100% consistency and accuracy between boards. The wood is now ready to be made into frames. 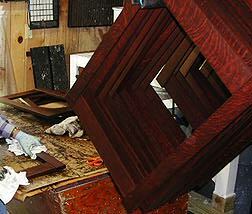 Once the molding is prepared, it is now ready to be cut into the desired size. One of the most difficult aspects of making a frame with a mitered corner is cutting the actual miter. There is no room for error, otherwise unsightly gaps will be visible. 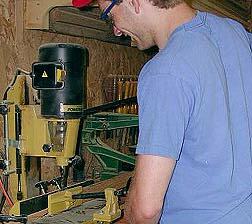 We use an industrial Pistorious double miter saw to do the job precisely. This piece of equipment cuts two miters at the same time. After the miters are cut, a concealed slot is cut into the end of each piece to allow a biscuit to be glued in place. This gives the joint its strength. The frames are then clamped together and allowed to set overnight. Both sides are laboriously sanded until they are smooth and free from any scratches. It has taken us many years to perfect the finish we use on our frames. 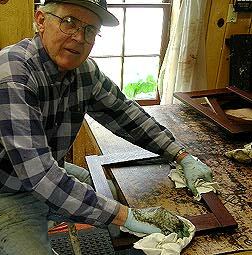 It is a four step process, the final of which is a hand rubbed wax, just like Stickley used on his furniture. This gives our work the patina of a well seasoned family heirloom that will withstand sunlight and wear and provide beauty and enjoyment for years to come. Our mortise and tenon frames are more labor intensive to produce than a mitered frame, but the age old look is well worth the trouble. We start by sizing both the vertical and horizontal members. The vertical pieces are placed into a mortising machine which carefully cuts out a slot to accept the horizontal tenon. The tenon is then fit into the mortise, and then clamped. A hole is drilled through the upper and lower ends of the vertical pieces, also going through the hidden tenon. 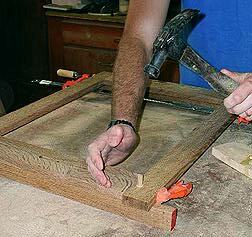 A dowel is then placed into the hole thus locking the frame together. 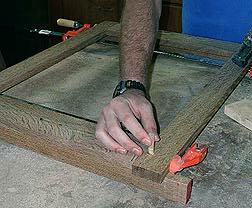 The frames are then sanded several times until they are ready for final finishing. We are one of the few frame shops around capable of doing custom production work. No matter what your needs are — for one frame or 100 — we take our time to ensure each frame is made to our exacting standards. 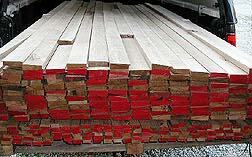 And, we’re within easy driving distance to the sawmill supplying our quartersawn white oak, keeping our costs low. We have made custom mirrors and frames for many hotels, resorts and retreats around the country, and look forward to providing you with the highest quality product possible.